Back in the summer, tech startup Nuro teamed up with supermarket giant Kroger for autonomous grocery deliveries to customers in Scottsdale, Arizona. Initially, the service used self-driving Prius hybrids, but this week Nuro switched over to its far cooler “R1” autonomous delivery pod. While the Prius had a safety driver on board, the R1 delivery pod is unmanned and instead monitored remotely. To use the service, customers place an order with Kroger via a smartphone app. Back at the depot, staff load up the autonomous pod’s secure lockers with customer orders and then send it on its way. When the R1 arrives at a scheduled stop, the customer simply taps in a code to open the locker and access their groceries. A video (above) released to coincide with the launch of the R1 shows the pod making its way along various streets in Scottsdale as it carries out its deliveries. “This is exciting, this is the future,” said one woman who used the service. As Ferguson pointed out in his post, being the “best” vehicle means, among many things, a strong focus on safety. 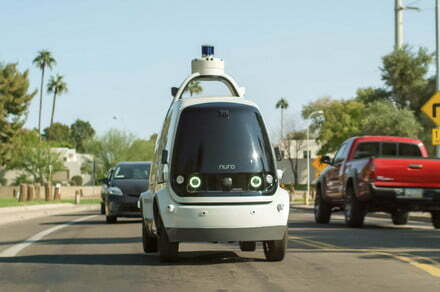 Ferguson said that to his knowledge, Nuro is now operating the first full-fledged unmanned delivery service for the general public. There’s plenty of competition out there, however, with the likes of Waymo, AutoX, Udelv, and U.K.-based Oxbotica, to name a few, already conducting trials of similar services. Nuro has certainly come a long way in a short time. Ferguson founded the company just over two years ago with Jiajun Zhu. Both gained valuable experience when they were part of Google’s autonomous-car team — now Waymo — in its early days.